Makita DTW190RMJ 18v 2x4.0Ah Lithium-ion LXT Impact Wrench + 10 piece Socket Set. Model DTW190 is an 18V cordless impact wrench with an optimal tightening torque of 190 N. 0 - 2,300 rpm. Body + 2 4.0ah batteries, Charger and Case. Equipped with Battery protection circuit: designed to protect the battery from damages due to over discharge, high temperature or overload current. Ergonomically designed handle with rubberised soft grip fits your hand perfectly to provide maximum control and comfort. 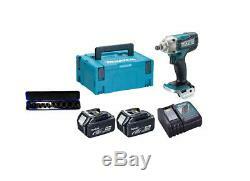 We are an internet based company with over 25 years of experience of supplying hand and power tools to the industry. We only deal with New and Branded Tool manufactures such as Makita, DeWalt, Stanley, Stabila and Marshalltown. As can be seen from our Feedback we pride ourselves on customer service including after sales care. All items are despatched after payments have cleared into our account. Our postal rates are reasonable and honest which take into consideration the labour and material costs. In this instance a redelivery charge will apply. It is also advisable to provide an address where someone will be in to sign for the item, to avoid any disappointment. Please note we do not make deliveries to PO Boxes. Our carrier aims to deliver within 24 48 hours within the UK. Our European deliveries depend on the location and can take from 2 5 days from the point of despatch to be delivered depending on the town and country. All machines are UK models and are CE marked. The item "Makita DTW190RMJ 18v 2x4.0Ah Lithium-ion LXT Impact Wrench + 10 piece Socket Set" is in sale since Tuesday, March 27, 2018. This item is in the category "Home, Furniture & DIY\DIY Tools & Workshop Equipment\Power Tools\Cordless Drills". The seller is "brandedtools1" and is located in Southall. This item can be shipped to all countries in Europe, Australia, Canada, Brazil, Japan, New Zealand, China, Israel, Hong Kong, Indonesia, Malaysia, Singapore, South Korea, Taiwan, Thailand, Chile, Antigua and barbuda, United States, Mexico, Bangladesh, Belize, Bermuda, Bolivia, Barbados, Brunei darussalam, Cayman islands, Dominica, Ecuador, Egypt, Guadeloupe, Grenada, French guiana, Jordan, Cambodia, Saint kitts and nevis, Saint lucia, Sri lanka, Macao, Maldives, Montserrat, Martinique, Nicaragua, Oman, Pakistan, Peru, Paraguay, Reunion, Turks and caicos islands, Aruba, Saudi arabia, South africa, United arab emirates.